Did you know that “chicken” is the most-searched term on Google Philippines for recipes and food preparation? We have all grown-up eating arroz caldo specially when we were feeling under the weather, excitedly grabbing that fried chicken drumstick at birthday parties, and passing on that heirloom chicken afritada one generation to another. 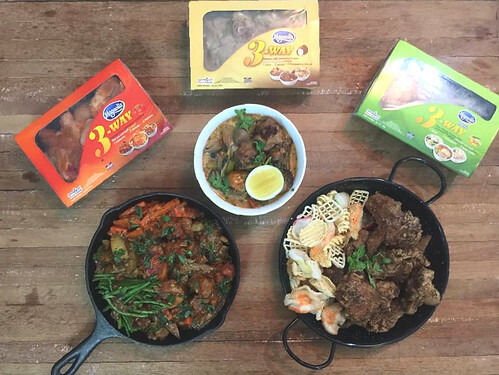 Indeed, these are all testament to Pinoy’s love for chicken on the dining table. It’s but fitting that we do chicken for the first installment of The Foodie Station’s original kitchen-tested recipe series: #TheFSCooks. Our inspiration is this new product we saw from Magnolia during one of our supermarket trips. Pre-cut chicken that is already marinated! Not exactly groundbreaking you would think, but this is not your usual BBQ, tocino, or inasal flavors, commonly found in pre-packed chicken, ready for grilling and frying. Choose from three different base flavor marinades – ginger, tomato, and gata. That’s the first time we saw fresh chicken seasoned that way, and it got all our culinary creativity flowing! 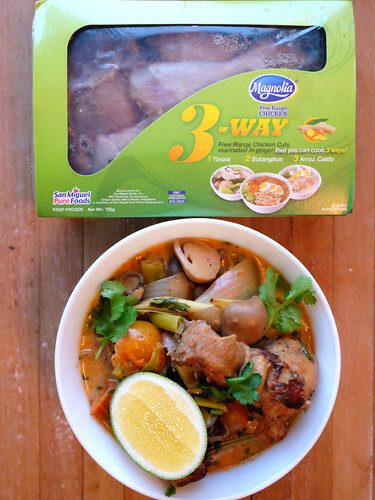 Each Magnolia Chicken 3-way pack (Php 199/750g) already has three recommended recipes which can be prepared in three easy steps – boil, add ingredients, enjoy! The ginger variant can be turned into tinola, sotanghon, and arroz caldo; the tomato variant into caldereta, afritada, and pochero; and gata can make pininyahang manok, curry, and adobo sa gata so much easier. The beauty of it? No need to “gisa” or add other seasoning to get the rich, home-cooked goodness of these recipes; simply use the marinade the chicken is soaked in. You can read through those classic recipes when you buy the pack. Since we were feeling a bit extra in the kitchen, we thought of playing with these flavors and bringing you some reimagined dishes to level-up your everyday chicken ulam. Our takes on the three flavors are equally easy to prep and definitely bursting with comforting deliciousness. Ginger – We wanted to make this into something reminiscent of the warm memories associated with tinola, sotanghon, and arroz caldo, but with more character. So we looked outside the Philippines and let our imaginative taste travel to Thailand where ginger is a cooking essential. 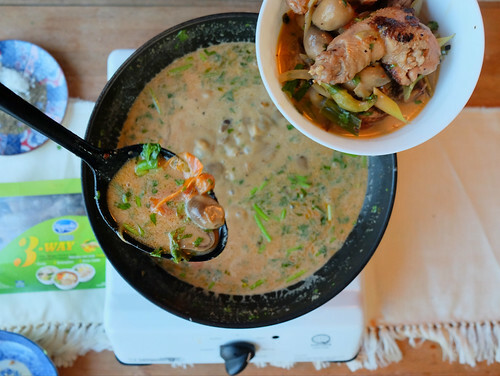 The iconic Tom Yum Soup really highlights the fragrant zing you get from ginger, and chicken is the perfect canvas for the bold flavors that meld together in this hearty dish. 1. Heat oil in a large pot and lightly brown chicken. 2. Stir in onion and lemongrass and saute for 5 minutes. 3. Add water, fish sauce, coconut sugar, and lime juice. Simmer for 15 minutes. 4. Stir in coconut milk, mushrooms, tomatoes, leeks and cilantro. Simmer for another 5 minutes. 5. Garnish with cilantro leaves. Serve piping hot with lime wedges. 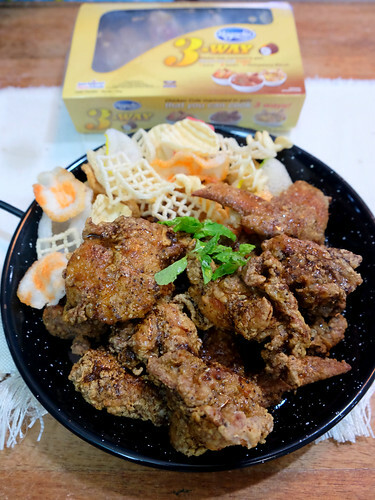 Gata – Coconut milk is definitely not an obvious ingredient for fried chicken. Deconstructing the typical curry was the challenge, so we thought of Curried Butter Fried Chicken with Honey as the intersection of classic and contemporary. Gata, aside from its distinctively sweet note, also acts as a tenderizer and the wet dredge to create that crispy exterior (usually done with milk). 1. Heat oil in a deep pan. Deep frying is recommended but shallow frying in 1-2 inches of oil should also work. 2. Dredge the chicken with combined flour, cornstarch, and curry powder. 3. Fry in oil for 15 minutes (5-7 minutes per side if shallow frying). 4. Toss in the butter and curry mixture. 5. Season with salt and pepper to taste, and drizzle with honey. Tomato – Immediately, Italian was the direction we wanted to take when we saw this. The key to Italian cuisine is cooking with just a few quality ingredients. This Italian Chicken Skillet definitely fits the bill. The zest and the tang from the tomatoes create that umami bomb in your mouth with every bite. We prepared it here with some vegetables, but a side of pasta or rice would also be great! 1. Heat oil in casserole and lightly brown the chicken on all sides. 2. Add the garlic, onions, and herbs to the chicken and saute until fragrant. 3. Stir in remaining marinade and water to the pan and simmer uncovered on low heat for 20 minutes. 4. Serve with a side of vegetables. You may opt to stir in the carrots, beans, and potatoes during the last 5 minutes of cooking. 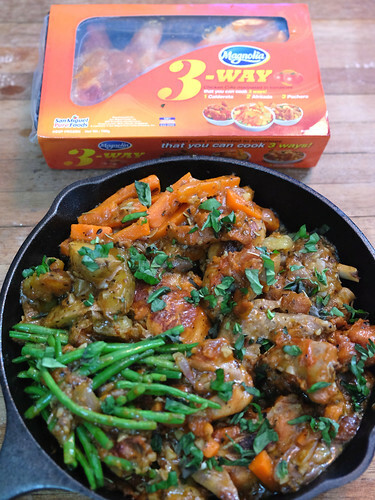 You now have #3WaystoWOW your family and friends (and make them think you slaved all day in the kitchen!) Try these three new #ChickenMadeEasy recipes using Magnolia 3-Way Cut-ups for enjoyable home-cooked meals without the hassle.